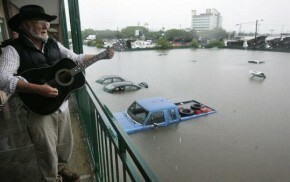 Though the Nashville flood is long behind us on the calendar, for many of us it is still fresh in our minds and hearts. The damage is done, the cleanup is all but finished, and things are back to where they should be, for the most part. Hell, Gibson is still rockin’ and rollin’ just as hard as they ever were. 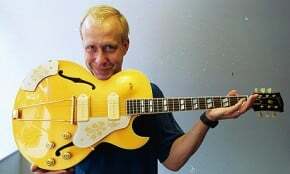 As you may or may not remember, Gibson’s Nashville plant was hit especially hard in the flood, laying waste to every guitar they had, including some hall-of-famer guitars. So now that the newsreel has halted on this subject, and all the speculation has come to a close, we are left to commemorate and honor the lives and careers (not to mention the guitars) ruined in the flood. Gibson’s method in doing this however, has come under fire and close scrutiny, as they chose to release the Gibson Anniversary Flood Les Paul Studio, available at Musicians Friend for $1,549.99. Many voices have called greed, with Gibson profiting on a guitar birthed from a national disaster. 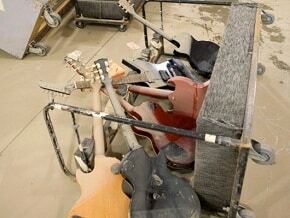 When the floodwaters reached the Gibson plant, several drums of lacquer spilled on the floor. When the waters receded, an oddly attractive “swirl” pattern was left in its wake. Soon after, the Anniversary Les Paul Studio guitar was born. This new ax features a finish with the same pattern of the aforementioned lacquer incident. 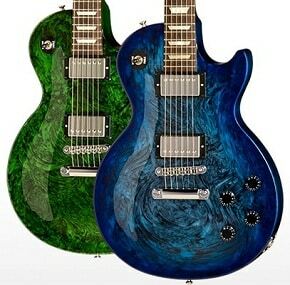 So the question really is: Is it right for Gibson to collect a profit on these guitars? I say yes. In the aftermath of the flood, Gibson has extended every hand to help those affected by the flood. Using the reach of the Gibson Foundation, a special program solely for flood relief was created. The most popular of Gibson’s efforts, was a “bank” idea, that created several donation banks, made from actual Gibson guitar cases, and involved placing them in popular and landmark locations in Nashville to help fund relief, all which took place from early may to early June. Other relief support was offered through a sponsored event titled Night Out for Nashville – An Evening for Music City Flood Relief. These are just a few of Gibson’s actions to aid the people of Nashville, and I say if they want to make a commemorative guitar, and make a little coin on it, that’s alright with me. After all, they were a victim here too. It is clear that Gibson put their best foot forward in the fight for recovery, and have proven themselves to be a major player in relief support. The fact that they pulled something interesting and different out of it is purely a bonus, the way I look at it. They could have shut up and dealt with the destruction, moved on, and been the same old same old. But they didn’t. They chose to rise to the challenge and step up to the plate on this one; Well done Gibson.